Discover A New Way To Rent! Then use Build a Tux to mix and match ensembles, accesories and colors to create a customized look perfect for your wedding. Once you have created some favorite looks, set up an account and your wedding event; it less than a minute to do so. Jump over to Event Manager to add your party members. Assign the looks you created in Build a Tux to each, enter measurements, and pay for your rentals. We’ll even send your guys reminder emails to keep them on track. Your rental will arrive at least five days prior to your event, plenty of time for your to try it on and make sure everything looks and fits great. If something doesn’t fit, Jim’s will fix it! Just try on your ensemble within 24 hours after receiving it, notify Jim’s Formal Wear of any issues by calling (866) 783-5767, and they will get a replacement item out to you right away, for free. Jim’s is nationwide. With seven Service Centers across the country, they can respond quickly to your needs and the needs of everyone in your party. Your $20 shipping fee covers shipping both weays along wtih any replacement items you might need. When your event is over, send your ensemble back in the shipping bag provided. Only the best styles for you. Jim’s tuxedoes and suits reflect the latest in today’s ashion and are designed by such talented designers as Michael Kors, Ike Behar and others. Do they have slim fits? Yes! Jim’s offers the best-fitting ultra slim and slim fit styles available. Dress all your gentleman in the best fit for their body type to ensure a flattering look. Fitting concerns? Not a problem. Jim’s extensive inventory lets us fit everyone in your wedding party with sizes ranging from a Boys’ size 3 to a Men’s Size 66 Long. Choose styles tailored in super fin wool to make your guys look great and feel comfortable all day long. With 50+ years of experience behind Jim’s and more than 20 million satisfied customers, no national formalwear source has been in the tuxedo and suit rental business longer. We know formalwear. 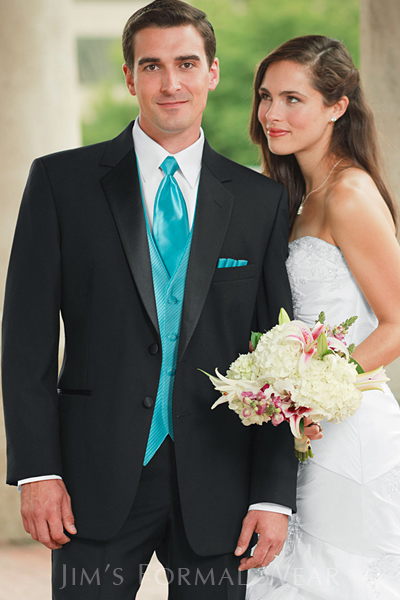 Jim’ Formalwear intends to deliver a delightful rental experience to you and they will do everything they can to make sure it happens. If you have any questions or concerns before or along the way, call Jim’s at (866) 783-5767 or send an email to support@jimsfw.com. Their customer service team is waiting to hear from you. Save $40 per ensemble Rent online and save a cool $40 off the rental price for each member of your wedding party. That’s money in the hand of each of your groomsmen. Good news for the groom! The groom’s ensemble is free when you rent six or more ensembles.